Not that long ago, my sister pointed out that I tend to make a lot of wreaths. What? No way. But then I started going through my blog archives and I realized that I do tend to make one for almost every season. 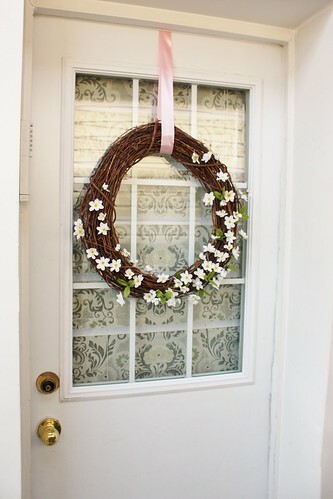 It’s not so much that I’m a big fan of wreaths or anything, but I have to admit that they can be a really inexpensive way to decorate up our gloomy front porch. 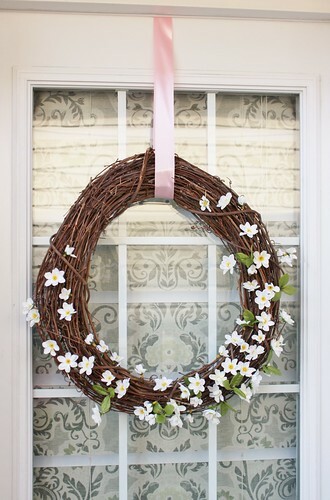 This Spring Blossom Wreath didn’t cost me a cent because I already had everything on hand, but even if you did have to pick up the supplies, you can do it for about $6 (cost breakdown at the bottom). Not too bad for a little seasonal sprucing up. 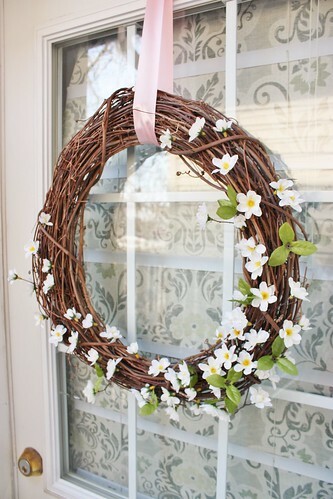 You can feel that spring is on it’s way here, but we’re still dealing with a whole bunch of grey dirt and brown icy patches, so I thought that having some fresh floral touches and a soft pink satin ribbon is just what our porch needed. I arranged the blossoms so that they seemed to be growing out of the wreath from the bottom right corner and then slowly floating up the wreath. 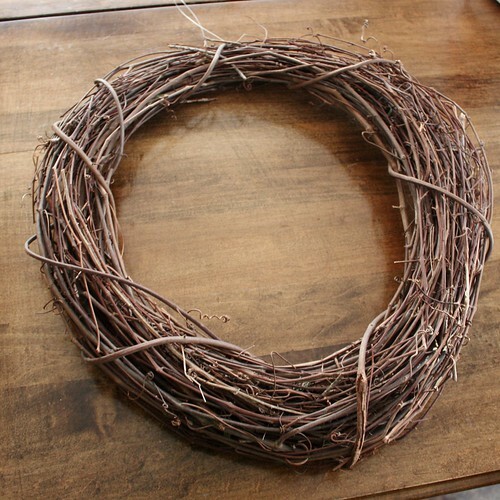 This $3 grapevine wreath has been really useful. This is the fourth wreath that I’ve used it for and it’s super easy to remove the old decorations and add the new ones. It’s the same wreath form that I used on the Grapevine and Greenery Wreath at Christmas and the last two fall wreaths I made – Autumn Berry Wreath and the Colourful Fall Leaves Wreath. 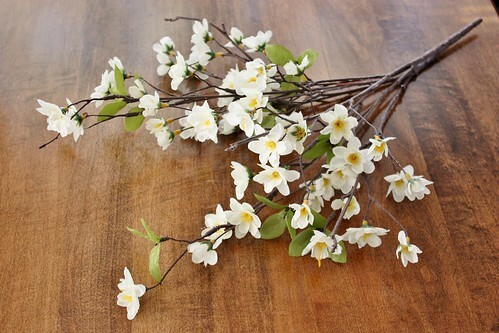 The branch of blossoms is one that I grabbed on sale at a craft store forever ago. 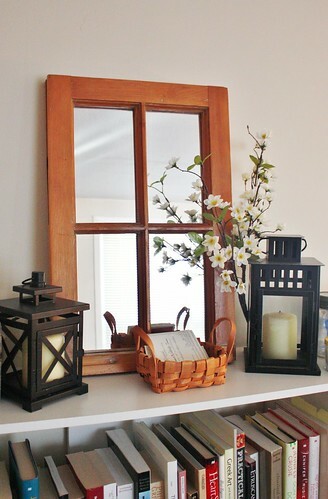 After I put all the holiday stuff away in January, I added it to our bookcase mantel with my favourite mirrored window, some lanterns and a little basket to hold all our wedding RSVP cards as they come in. It’s wasn’t really a display to blog about, just something that I did to liven things up for us to enjoy. The branch was really easy to disassemble. The flowers popped off the main branch in a set of two. All I needed to do was pop off each set of flowers. I kept the main branch so that after the wreath is done, I can add the flowers back to the branch and use it another time. 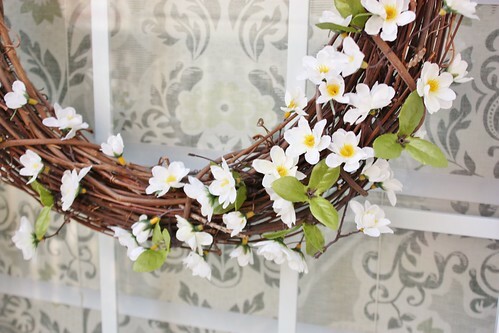 I’d thought about hot gluing the flowers to the grapevine wreath, but in the end I was able to use the little twig like pieces attached to each flower and weave those around the grapevine. 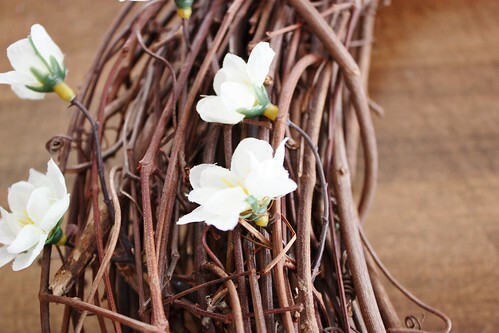 Alternatively, you could use florist wire to secure it. 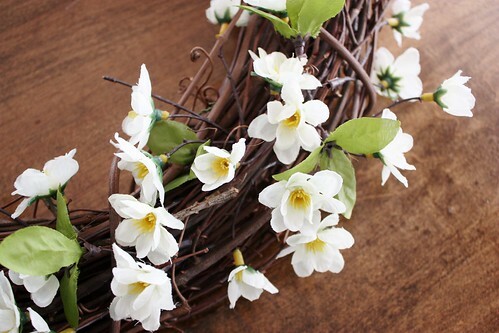 Our door is fairly sheltered, so I’m not worried about flowers falling off and flying away in the wind, but if you are, I’d suggest using a little of the wire. You can see here how I wove the plastic branches in among the grapevine. 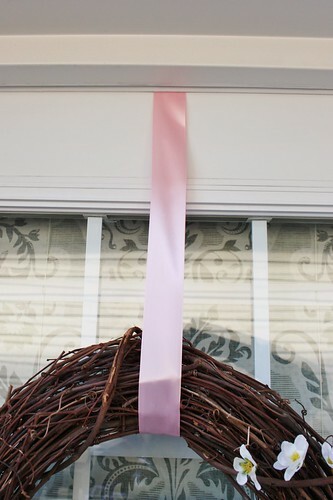 To hang the wreath, I used a loop of pink satin ribbon that was just long enough hang the wreath over the door and in the middle of the door window. I hooked the top of the loop to a nail on the inside part of the door frame, just above the Roman Shade I made for fix our broken mini blind. I already had everything on hand from previous projects, so this didn’t cost me anything, but if you needed to pick up the supplies, here is what it would set you back. Very pretty! I think I could make this!